I’ve been using Google Keep on and off for about a year, but I have been consistently using it at work as my Post-It replacement. It helps me keep my desktop clean and my notes organized. It’s sharable, searchable, and syncs across desktop and mobile devices. It’s also free. Because it’s a Google App, it works seamlessly with Google accounts. Initially, I wasn’t sure how to use it. It seemed redundant since Google already offers Google Tasks which is already integrated into Gmail, allowing you to turn an email into a task quickly. 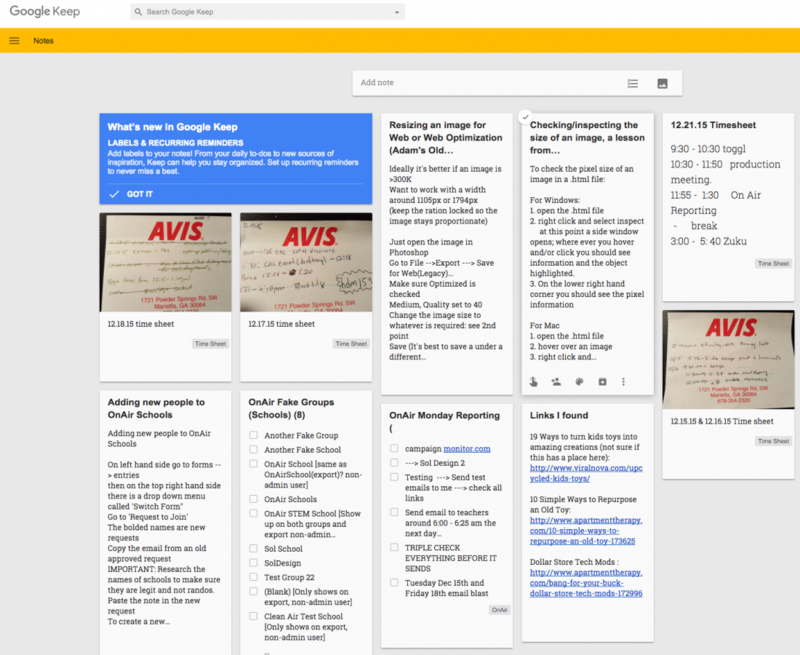 It was when I was in need of post-its (I ran out of the AVIS rental car Post-its) did I try Google Keep and wow! I was able to turn my Post – It system into something digitally organized and secure. For the record, I looked for Post-It equivalent apps in the Google App store and didn’t find anything that fit my (pseudo) system. Another thing I love about the app is the user interface on my mobile device. I use a Samsung Galaxy Note 5. It’s a tablet pretending to be a phone or the other way around. It’s a productivity device made for note taking. Emphasis on ‘note’. It’s not a replacement for a sketch book. Having the huge screen in the palm of my hand as a scroll through my digital sticky notes feels like I am actually holding a Post-It notepad in my hand, except my handwriting is neatly typed. Post-its aren’t a bad way organize, there are plenty of productivity methodologies that really work. But I’ve been meaning to declutter and tighten up my workflow and organizational habits. So Google Keep works for me. Summary: Google Keep can replace your sticky notes if you consistently use it. Google Keep is useless if you don’t even use sticky notes. Copyright © 2019 The Art is in the Process. Powered by WordPress and Saga.